A series of market trends are reshaping the financial management needs of companies of all sizes, especially small and mid-size businesses. As they grow, these companies are faced with the same business and legal requirements as larger enterprises. At the same time, the growth of the Internet has created an increasingly dispersed workforce that must submit key data to a company’s financial system and be able to access this corporate information from anywhere, at anytime to do their jobs. These requirements are driving some growing firms to investigate alternatives to packaged software such as Intuit’s QuickBooks® which many young companies rely upon in their initial stages. 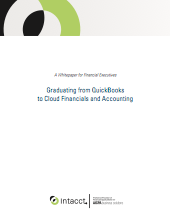 Download Graduating From QuickBooks to Cloud Financials and Accounting by filling out the short form below.